Here is the local color lay-in. I am still painting thinly here and with the colors I’m beginning to model some of the figure detail. This picture shows the monochrome under painting. 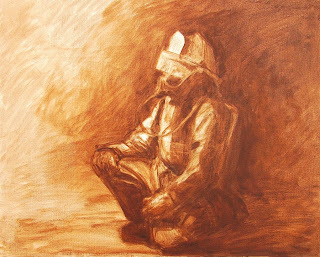 I used Burnt Umber thinned with Turpenoid. This was taken after the second layer of paint was applied making corrections to the original drawing. OK my last post was too negative, but I was really down. This week I managed to pull out of my funk, and start a new painting. 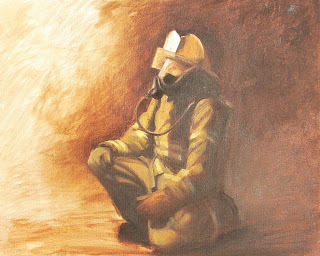 This is a painting of my son the fire fighter. He posed for me with his gear so I could take reference photos. I tried a process that I have read about. Where you start a painting by drawing on the support before applying any paint. I used vine charcoal here. For me, other than the fact that I love to draw I think I could have skipped this process. 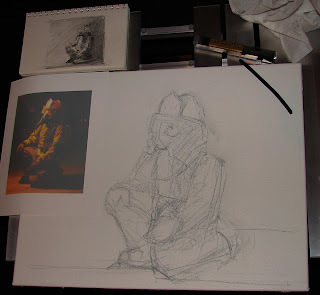 Here is a picture of the composition sketch, reference photo, and drawing on a 16" x 20" canvas.